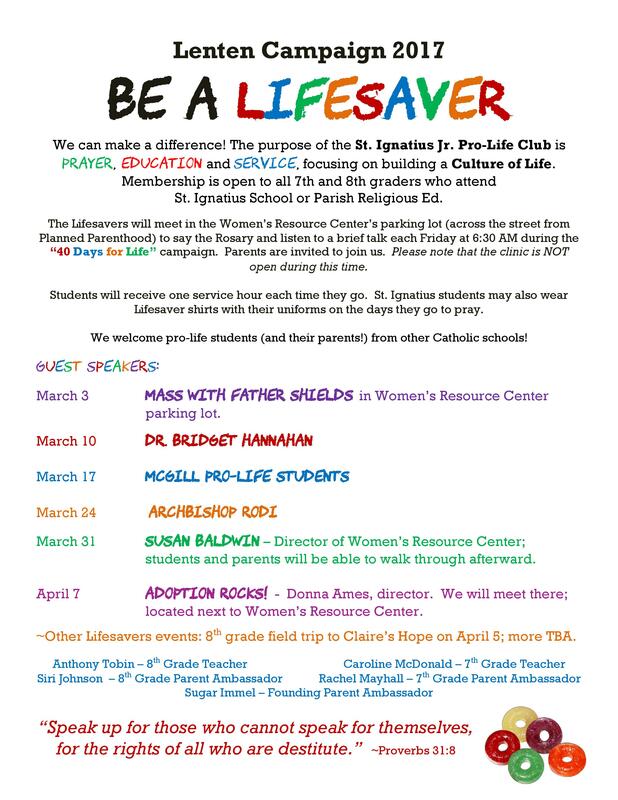 “Lifesavers” is St. Ignatius’ Junior Pro-Life Club. Its purpose is PRAYER, EDUCATION and SERVICE, focusing on building a Culture of Life. Membership is open to all 7th and 8th graders who attend St. Ignatius School or Parish Religious Ed. Students will receive one service hour each time they go. They can also wear Lifesaver shirts with uniforms on the days they go to pray. In addition to participating in "40 Days for Life," the Lifesavers also help with various service projects like the Mother's Day Carnation Sale for Life. For more information about joining, please contact Mrs. Sugar Immel at sugarimmel@gmail.com or the middle school junior high religion teachers, Mrs. Caroline McDonald or Mr. Anthony Tobin.